The Investec Songo Specialized team kept their unbeaten record intact in the Women’s category by claiming win number four on the longest stage of the Absa Cape Epic on Wednesday. Annika Langvad and Kate Courtney were able to power away from their rivals who could do nothing to stop their seemingly unshakable surge to the 2018 title on the 122km haul from Robertson to Worcester – and not even a crash into some other riders near the end, which brought both the leaders down, could stop their progress. While the three-time Women’s category champion and her novice partner were once again handling everything their rivals, the route and even other slower competitors could throw at them, the good news is that the races for second position on each stage are producing some excitement in what would otherwise be something of a procession. On Wednesday Langvad and Courtney rode away from their rivals twice, first to claim the Women’s Hotspot 17km into the stage, and then again with about 40km to go they surged to their race-winning break and built a substantial victory of well over five minutes and extend their overall lead to more than 12 minutes. Team Spur’s Ariane Lüthi and Githa Michiels and a resurgent Ascendis Health’s Sabine Spitz and Robyn de Groot fought a race-long battle for the runner up spot. Although both teams spent time chasing their rivals, the positions on the bottom steps of the podium were decided on a sprint with Lüthi and Michiels claiming second, also for the fourth day in a row. The vanquished pair from Tuesday’s sprint, Mariske Strauss and Annie Last (Silverback-KMC), had a tough day on Wednesday and finished a distant fourth. Strauss and Last are still third overall, but are now 12 minutes behind the Spur duo, and just seven minutes ahead of Ascendis Health, meaning the dice for the third step of the final overall podium is still far from finalised ahead of the final four days’ racing. Despite their dominant performance over the Prologue and first three stages, Langvad and Courtney know they can take nothing for granted, and the dramas they negotiated on Wednesday proved their point. “The thing about this terrain is that it is so rough and you can have mechanicals,” said Langvad. “Even on paper it looks like a comfortable lead but you still need to perform solidly because it is so unpredictable and a lot of things can happen out there. “Today there was some traffic with the guys who started ahead of us, both at the beginning and here near the end,” added the four-time World Champion when talking about the masters and grand masters riders who start five minutes ahead of the UCI Women’s batch. “Because of the format, there are guys out there on the course and in the beginning they were a little bit in our way and we had to yell to get them to get out of our way. 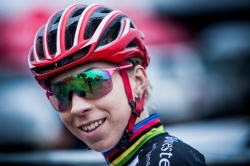 “And then again near the finish it turned a bit sandy and we wanted to overtake one guy and he just stood still … and we both went flying,” said Langvad, indicating herself and her partner. Their cautious view was backed up by a very happy five-time race winner Christoph Sauser, who is mentoring both the men’s and women’s Investec Songo Specialized teams that are now both wearing their respective race-leaders jerseys. “It is never wrapped up in the Absa Cape Epic. Physically Kate has never done eight days but at least now they do not have to go full gas every day. They just need to try to make up some time at the end of each stage, and if they do not make up time, or even lose a little, as they say it is still a winning day. “That was a really tough day. As a cross-country rider, and a newbie to the race and the stage racing game, 120 kilometres was a lot for me. Luckily for me, Annika, while she is such a champion, is also a great team player and she helped a lot. She took care of me and made sure I stayed within my limit, then when I was over my limit I got to ride the Annika Express home. In the race for the inaugural Absa African Women’s special jersey, Candice Lill and Amy Beth McDougall (dormakaba) consolidated their already impressive lead. Although McDougall has not been 100% healthy, it seems like only a disaster will rob them of the title. They lead by just under an hour with 14-time race finisher Hannele Steyn and extraordinary ultra-distance athlete Jeannie Dreyer (Nolands Spar) second with Nadia Visser and Katie Lennard (Western Girls) third.